This mountain is located a bit outside easy access. The most attractive starting locations are likely Gjendebu (boat on Gjende from Gjendesheim) or Torfinnsbu (boat on Bygdin). 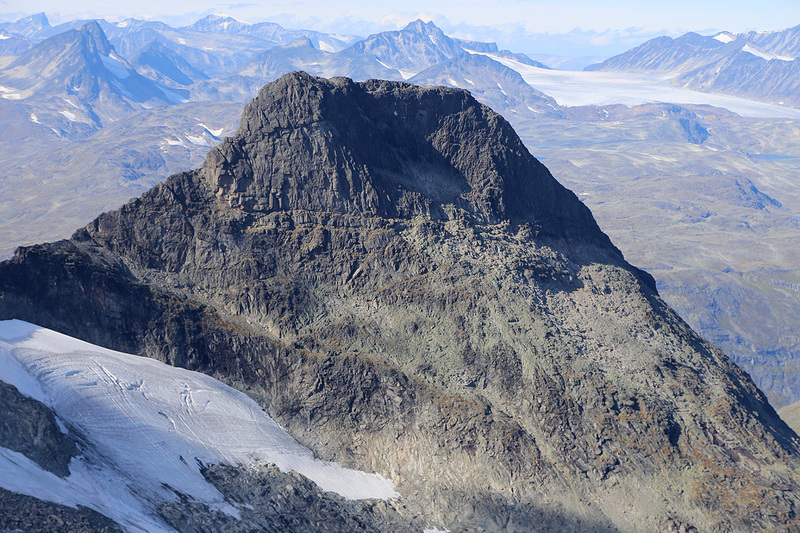 This description will be a route from Torfinnsbu, i.e. from lake Bygdin on the south side. 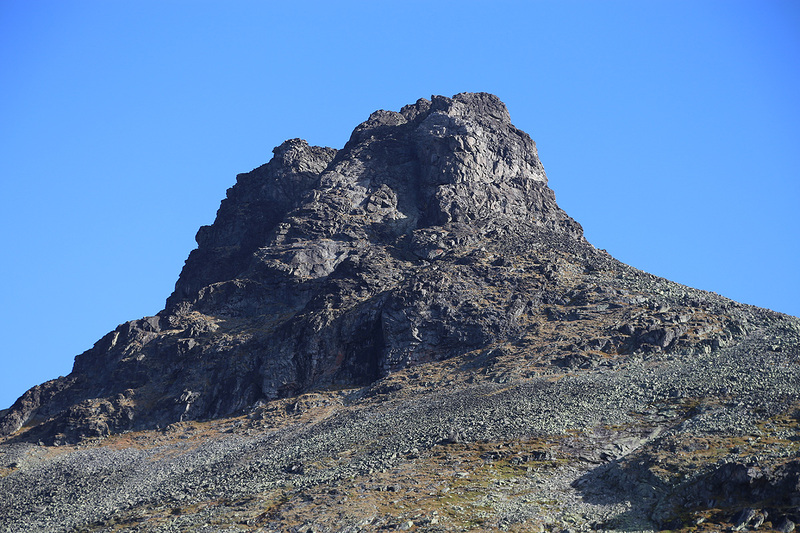 The comments below will describe the entire route across to Gjendebu at lake Gjende. Thus, one may use this to also get information about the route from Gjendebu. 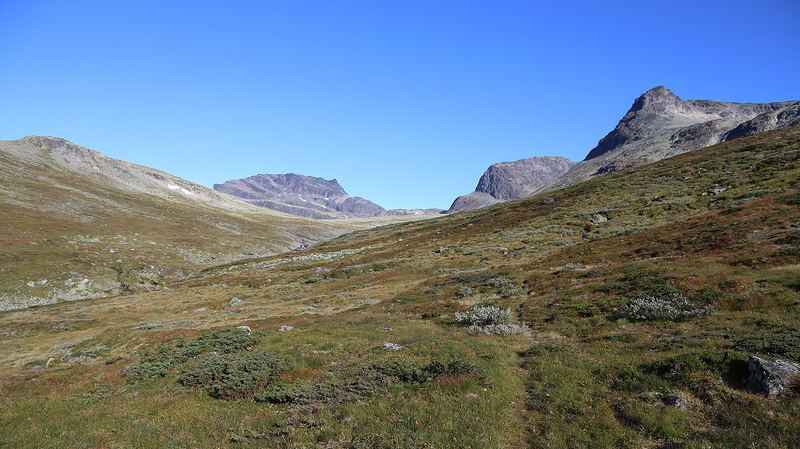 From Torfinnsbu, hike west on a good trail along Bygdin, to Langedalen. The trail turns into this valley and the main trail crosses the creek and then runs north parallel to the creek. 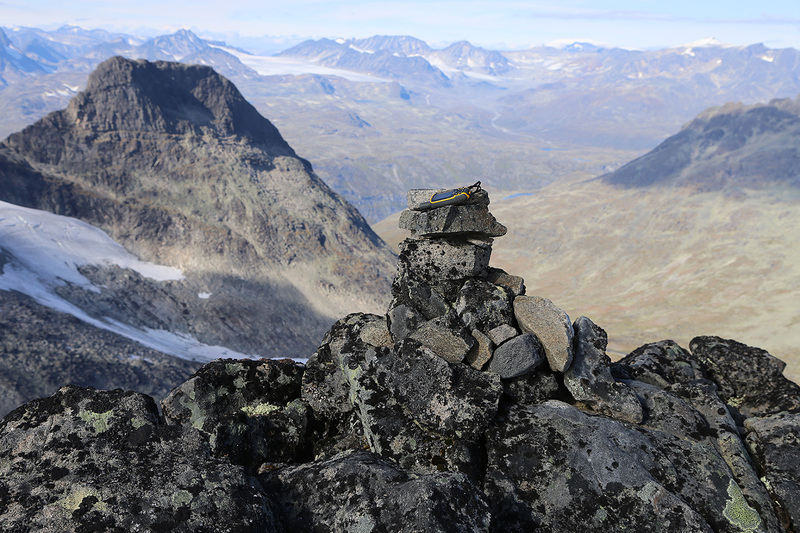 There is, however, a smaller trail, marked with some cairns, that runs into the valley while keeping on the right hand side of the main creek. This is a good choice for this climb. 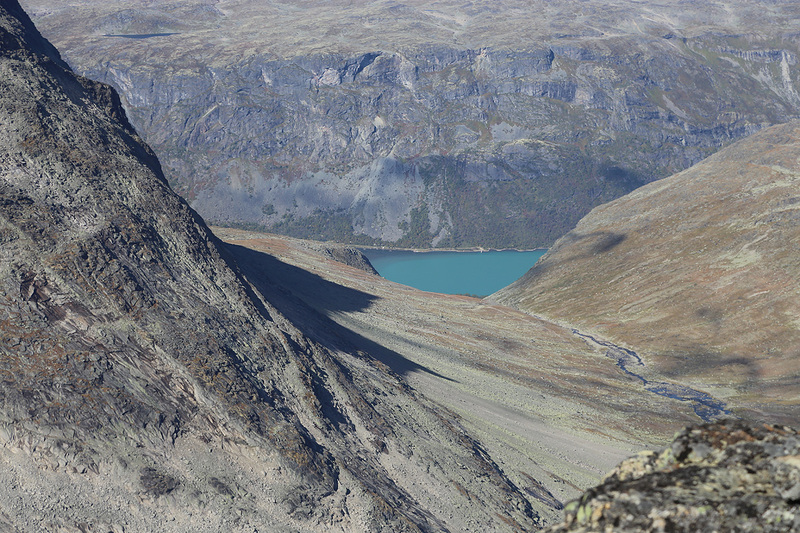 Continue until you reach lake Langedalstjernet (1513m), this lake will show up a bit below you on your left hand side. 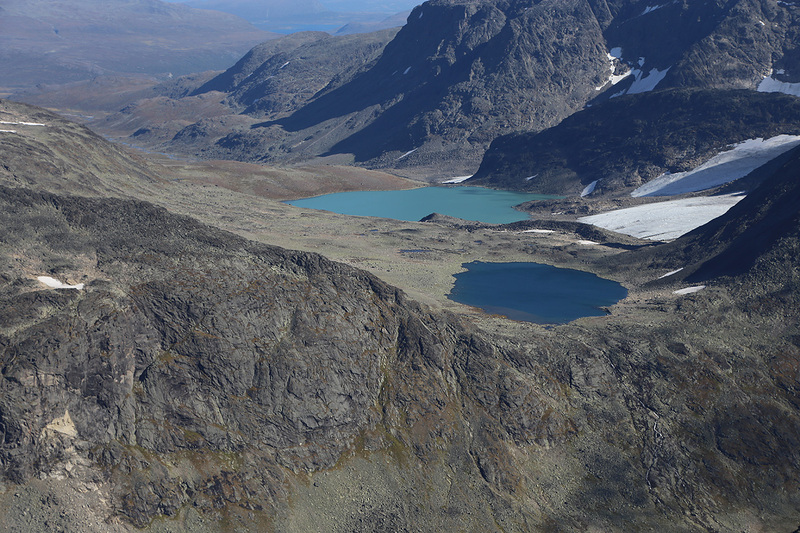 Continue a gradual ascent north of lake Langedalstjernet, while keeping right. 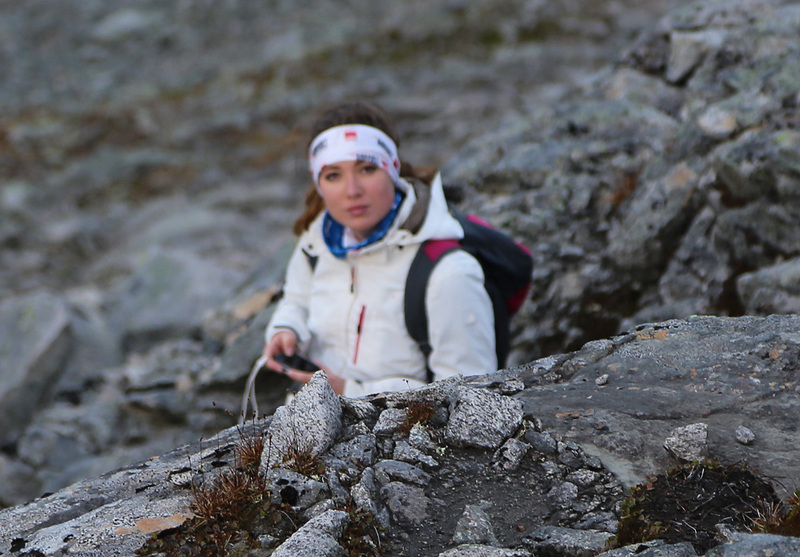 The terrain is quite ok and one may avoid most of the rocks in this area. Higher up, you will see the terrain above and partially right. Aim for the lowest point, this is the lower part of a fairly distinct gully that runs down from the Southern Langedalstinden. Ascend this gully, I stayed mostly all the way on the left side (when facing uphill), this worked well. Higher up, you may exit to the left in order to scramble on solid rock instead of the somewhat more loose terrain in the gully. There are several variations, all at (YDS) class 2. 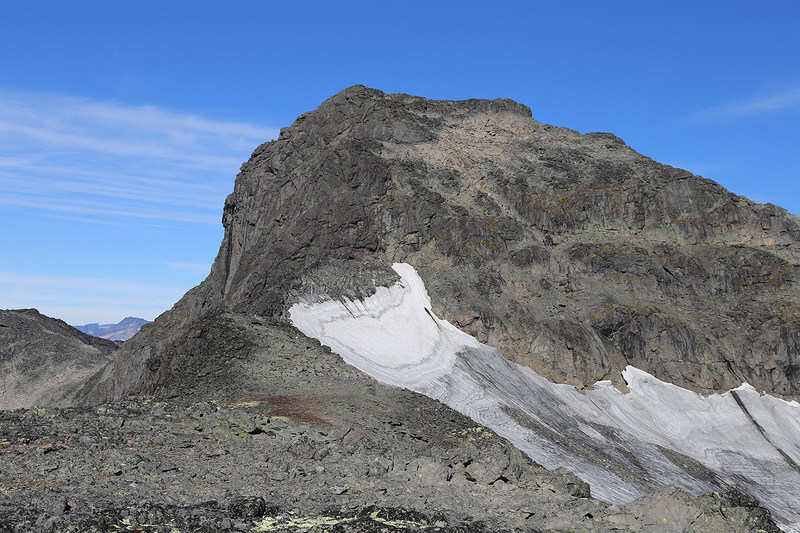 As the slope eases, one will next ascend to the top of South Langedalstinden, 2030 meter. 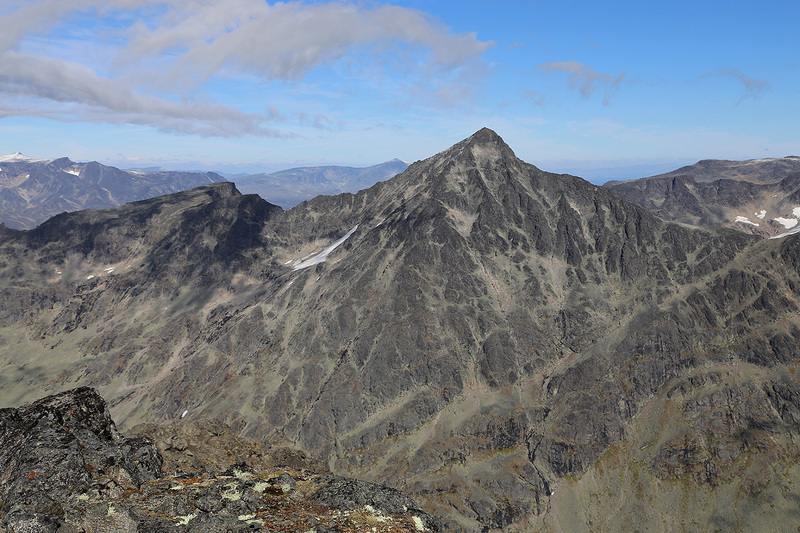 Continue along the easy ridge towards Midtre Langedalstinden (2045m). 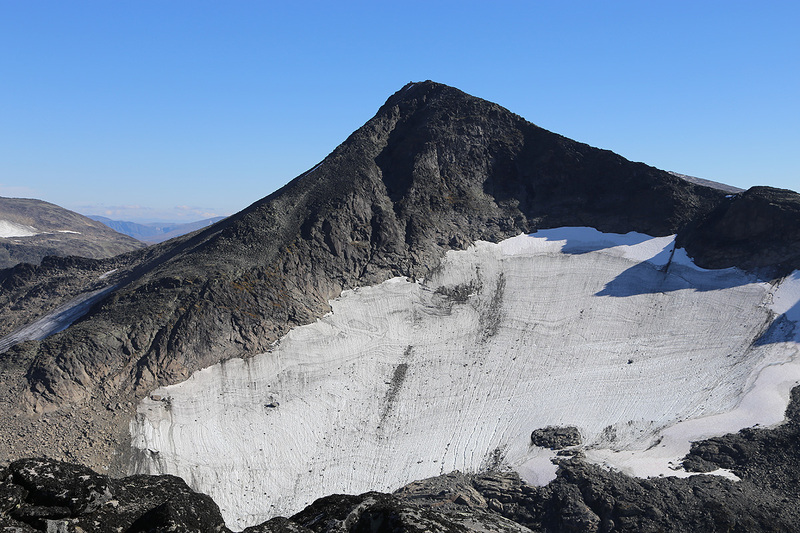 Do not climb this small hump, but rather stay right from the connecting saddle and descend along an easy slope to the "terasse" (normally alrgely covered by snow) that splits the face between Langedalstinden and Mersmogtinden. Cross on the snow, or late in summer, possibly on rocks alomg the lower (right) side. The route then turns directly uphill along a faint line of rocks. One should turn uphill at location N61.40042, E008.53149, elevation about 1970 meter. Continue straight up about as far as the route stays consistent, then go left and uphill on a large ramp. A bit before this ramp sort of ends, a small "rock gully" heads directly uphill. This is the route. Easy (YDS) class 3 climbing more or less along a straight line, will get you all the way up to the main saddle between Langedalstinden (left) and Mesmogtinden (right). 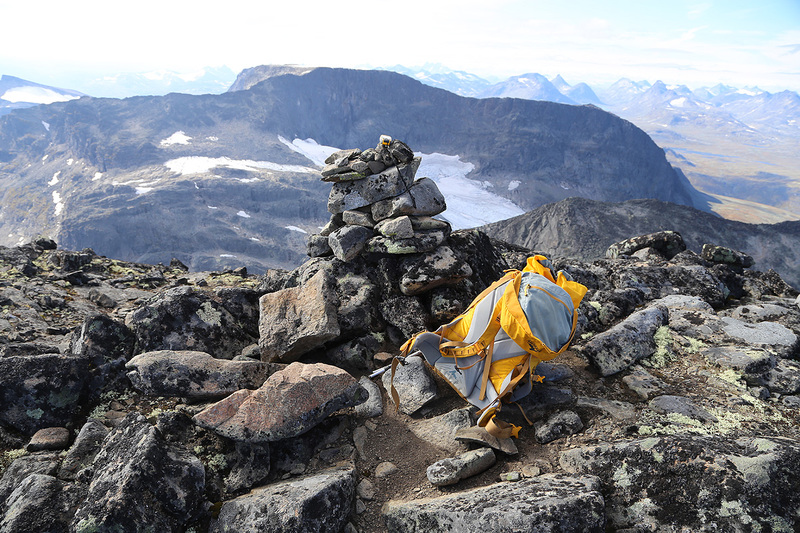 From this saddle, turn right and climb Mesmogtinden more or less along the ridge. If you stay on the ridge, then the climbing may be (YDS) class 4 a few places. 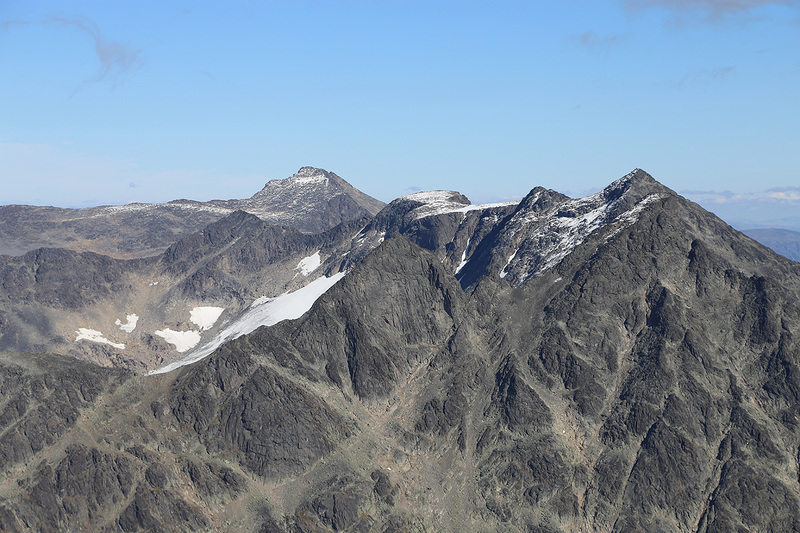 These spots can be avoided by going more right (south face) then regaining the ridge as soon as feasible. The difficulty can then be kept at (YDS) class 3. 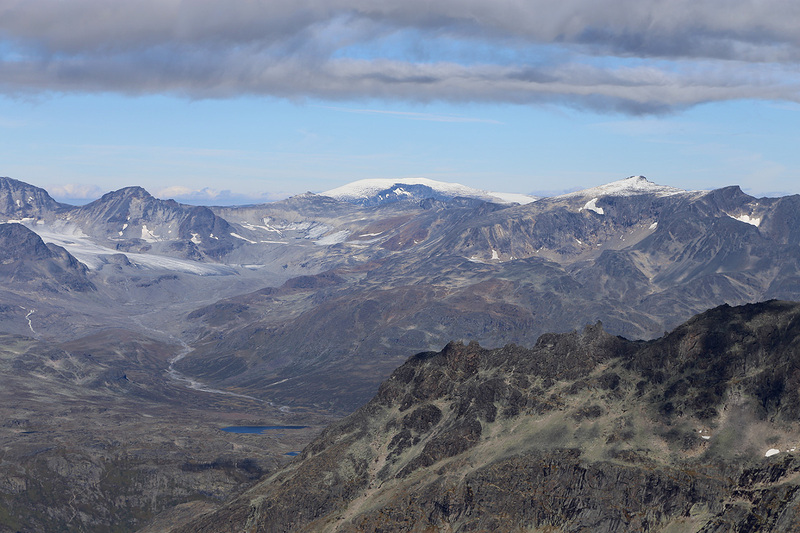 This was the big day of my 3 day Jotunheimen visit. I arrived Thursday evening at Fondsbu after about 4.5 hours drive from Bergen. Last time here, it was winter and we celebrated the 40th. birthday of Per Ove, beginning witna nice ski ascent of Galdeberget. 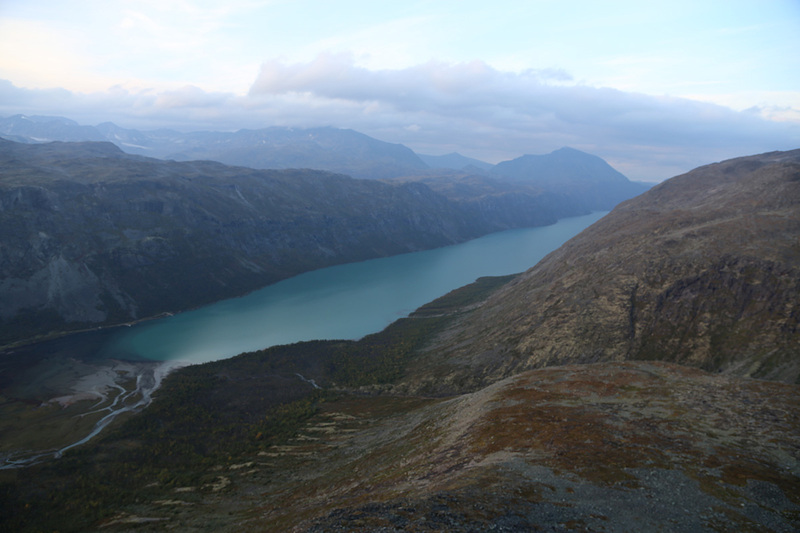 I was well received by Solbjørg and after a nice dinner and evening at Fondsbu, I slept well before breakfast and the boat Bitihorn that should take me to Torfinnsbu. 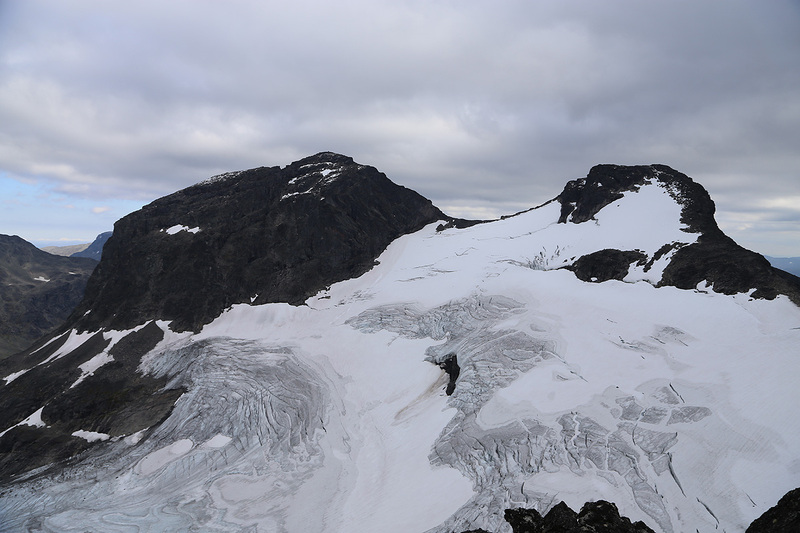 The crew was very service-minded, when they heard that I wanted to hike north in Langedalen, they immediately offered to make a special stop there. This would save me from walking several kilometer (back) along the Bygdin shores. Thus, I started my trip around 0900. After some initial bush-walk, I picked up the trail that climbs into the valley while staying on the right hand side of the creek. The day looked gorgeous, Torfinnstindane dominating the view up to my right. 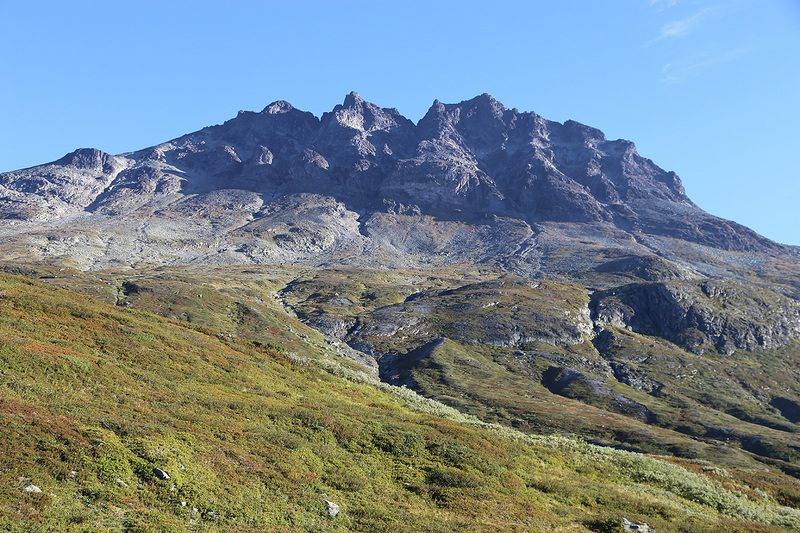 A bit later, the south-west ridge from Kvitskardoksle stood proudly guard of the valley. 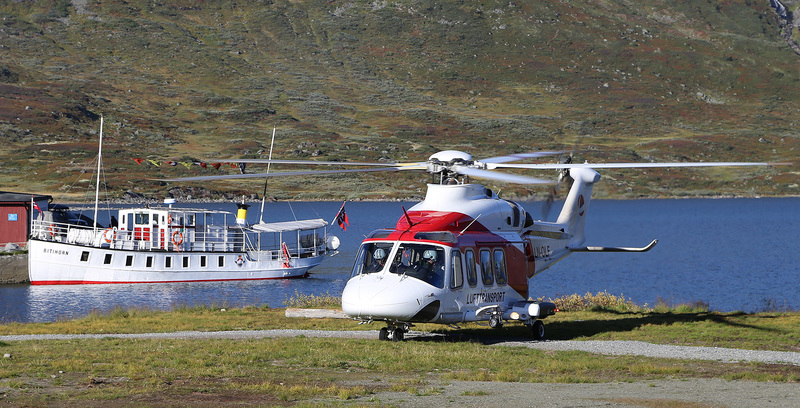 Further ahead, Søre Langedalstinden and Mesmogtinden also entered the scene. Further left Slettmarkpiggen blocked all terrain behind. 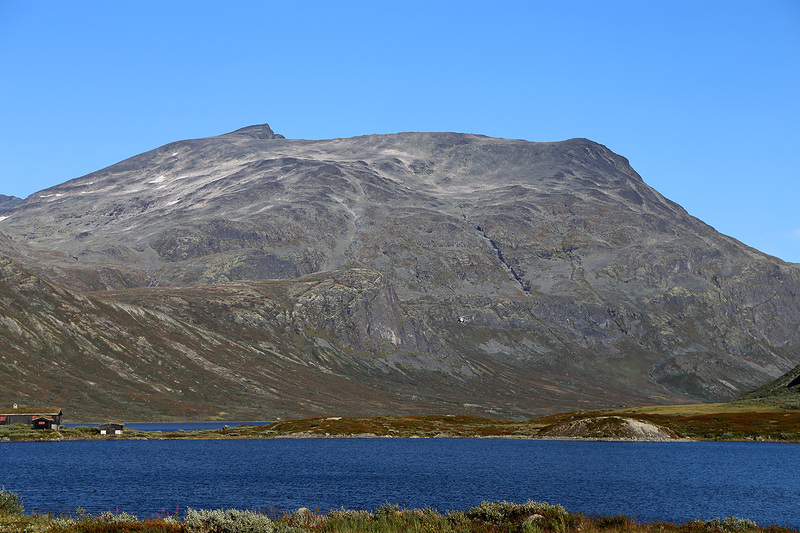 After quite some walking, I hiked near lake Langedalstjernet, 1513m and started to look for a good passage higher up. It looked pretty nice, I located a route that largely avoided rocks. After a while, I had a nice view back down to the lake. Looking ahead, the route seemed pretty clear, into the lowest point in the gully, then up, and hopefully this line would lead all the way to the top. This worked well, and soon I was on the first highpoint exceeding 2000m. The time was already 1230, 3.5 hours from Bygdin to here. 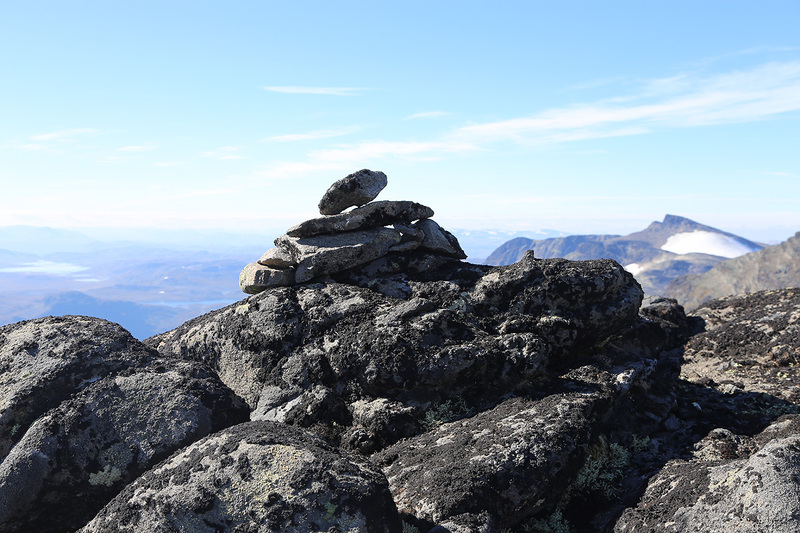 Søre Langedalstinden is not an independent mountain, but a nice point to hike past. 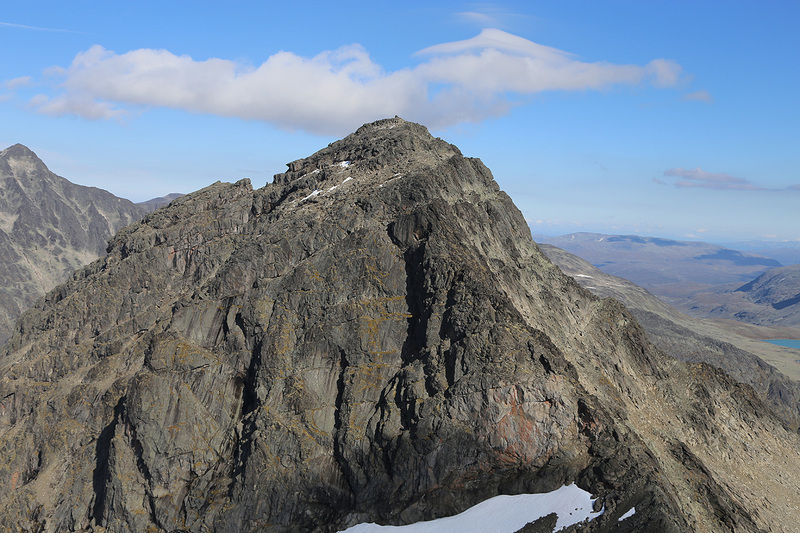 My next goal was Midtre Langedalstinden, since I believed that my route needed to pass this point as well. The big Langedalstinden completely overshaddows this little hump. However, when there, I realized that I could have passed it on the right hand side and saved myself a little bit of uphill. 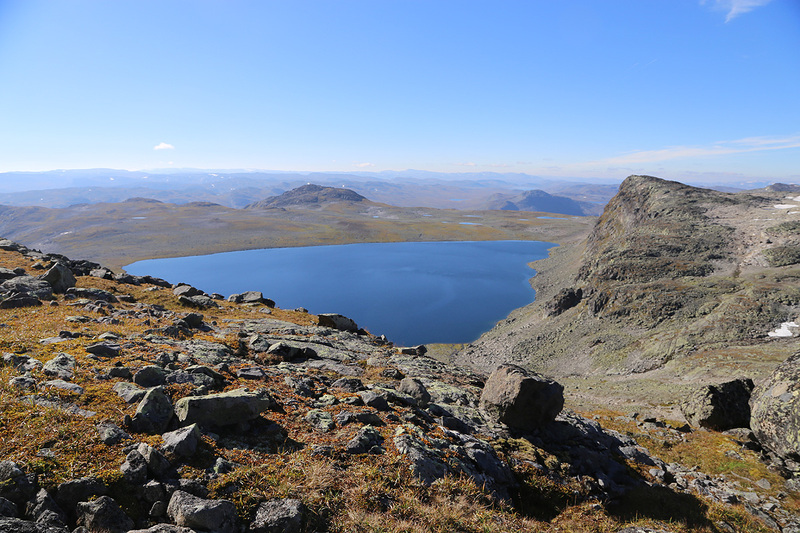 The view across to Kvitskardtinden is also very good from this location. 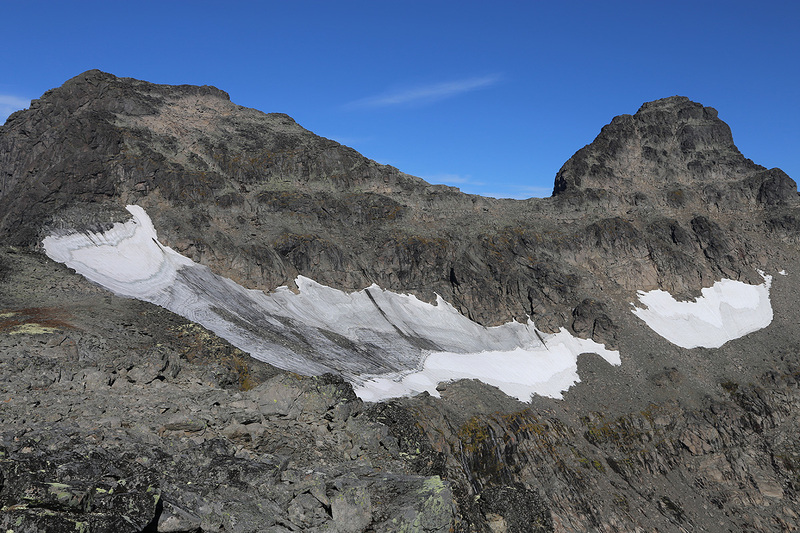 Descending to the partially snow-covered terasse in the face below the Langedalstinden-Mesmogtinden was easy and the terrain looked much better than the view from below. There was water here, this is indeed the last place to collect water on the ridge route that I now would begin. It was not at all clear to me from where to head uphill. It sort of looked reasonable to follow the line where rocks extended uphill quite far before the rock and small cliffs. This line is between the two big patches of snow. This turned out to be a good choice. I arrived near the top of the rocks, then explored a ramp that ascended going left. It eventually sort of ran out, but shortly before this, I had seen a possible route going directly uphill. I went back to this point and started scrambling up. This route was nice and quite fun, it soon was clear that I had picked a good way. On top of the ridge, the time was just passed 1330, so about one hour from the first summit point to here. I took a brief rest and truly enjoyed the landscape. Such a very nice day and there was absolutely nobody else anywhere near. 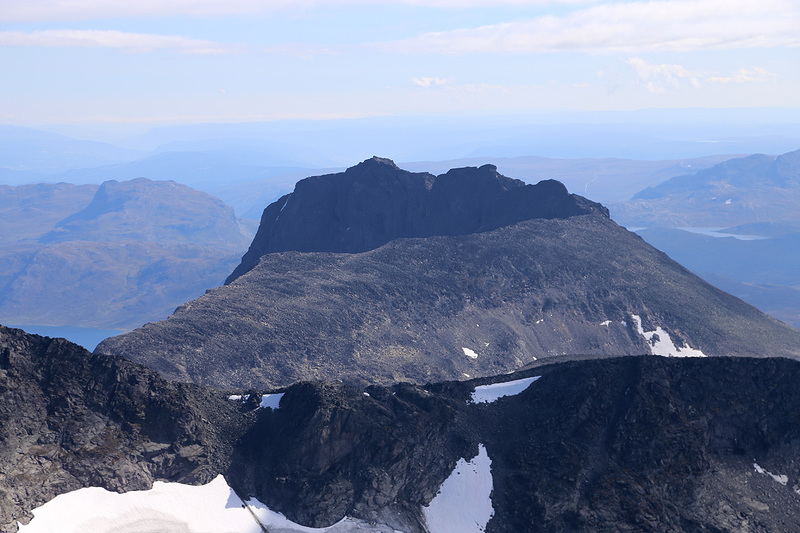 The climb of Mesmogtinden did not pose any problems, being solo, I did opt for the easier variant in a couple of places. Going straight up did not look very difficult, but a bit of extra margins seemed wise. 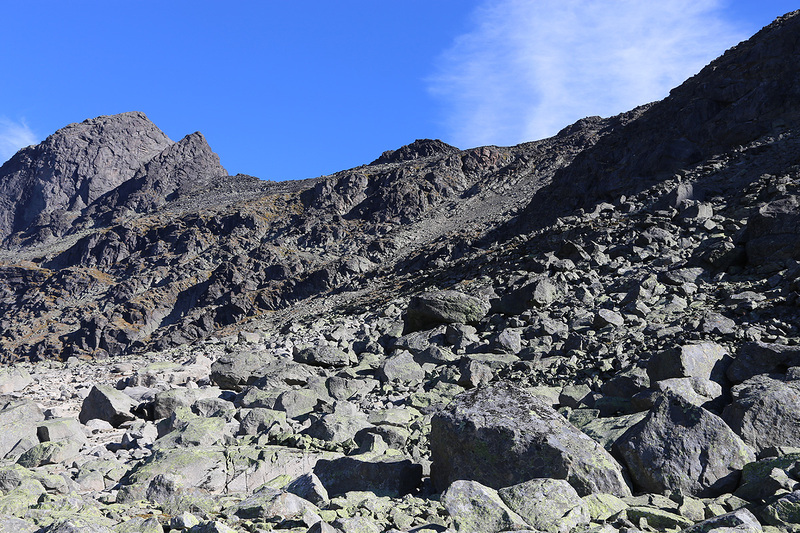 I summited at 1410, the climb had taken about 25 minutes. Very nice view all around. Hurrungan, further right, Glittertinden. The highest peak on this side of Svartdalen. The highest on the other side was a nice climb with my two boys, 16 years ago. 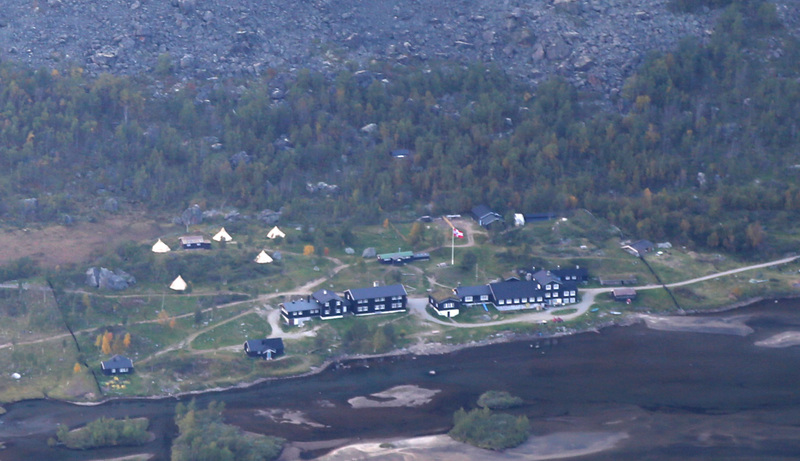 On that trip, we also traversed Tjørnholstinden, before setting of camp by the upper lake in Leirungsdalen. Torfinnstindane looked high from Bygdin, a very different view from here. 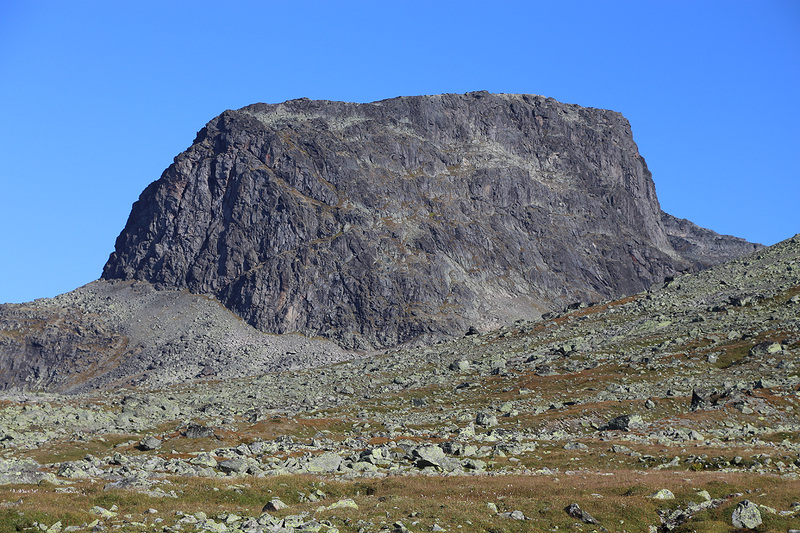 This was my main goal of the day, one of the 100 most prominent mountains in Southern Norway. 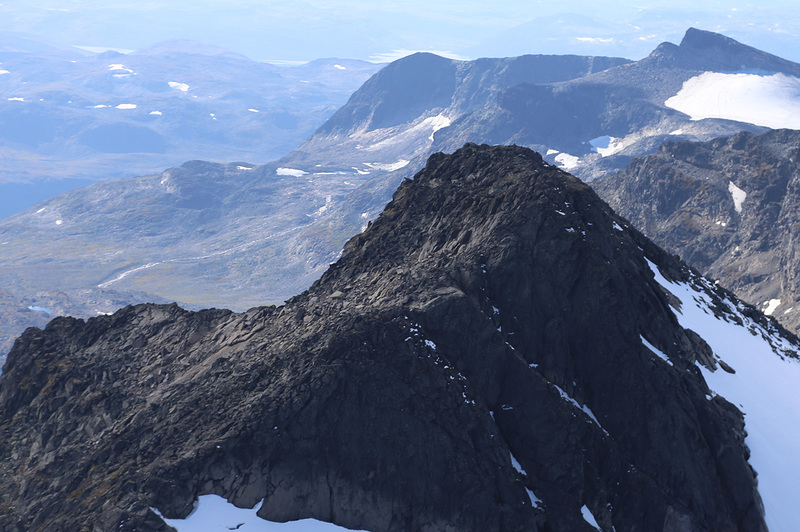 I left around 1425, what remained was still a pretty long traverse of connecting ridges (middle of picture) before I could descend to Gjende. Next and immediate goal was Langedalstinden. 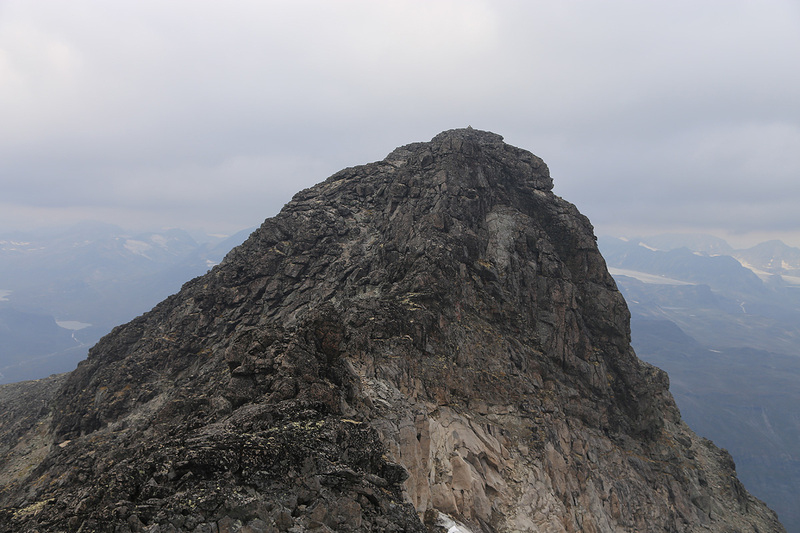 The scramble up here was not hard, but I somehow ended up directly on the west point of the summit ridge. I left my backpack and hustled across to the east summit point. Well, it turned out that the west point was indeed the higher. By the time I was back with my backpack the afternoon had advanced to 1515. Still some way to go, but I felt fairly optimistic, how time consuming could the rest of this ridge be? I could see as far as to Store Svartdalspiggen. 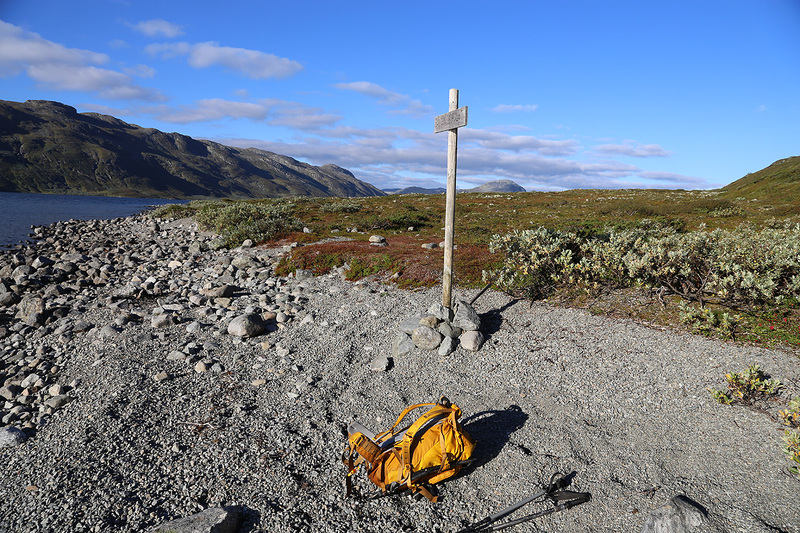 I waved bye-bye to Mesmogtinden and continued my route. Descending to the next col was easy, I discovered some new snow on this north facing slope and further down a permanent snow field that provided good footing. 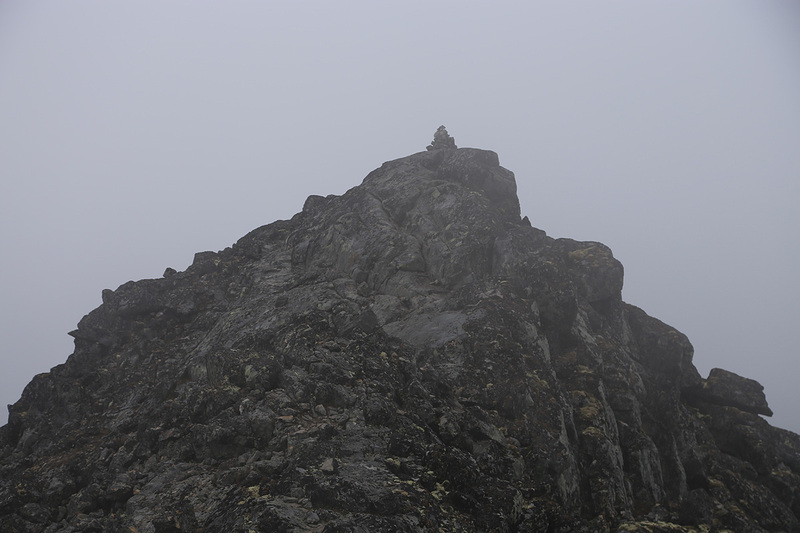 The ensuing ascent was pretty easy, but overall this ridge was a bit cumbersome. No big difficulties, but sort of rough terrain. 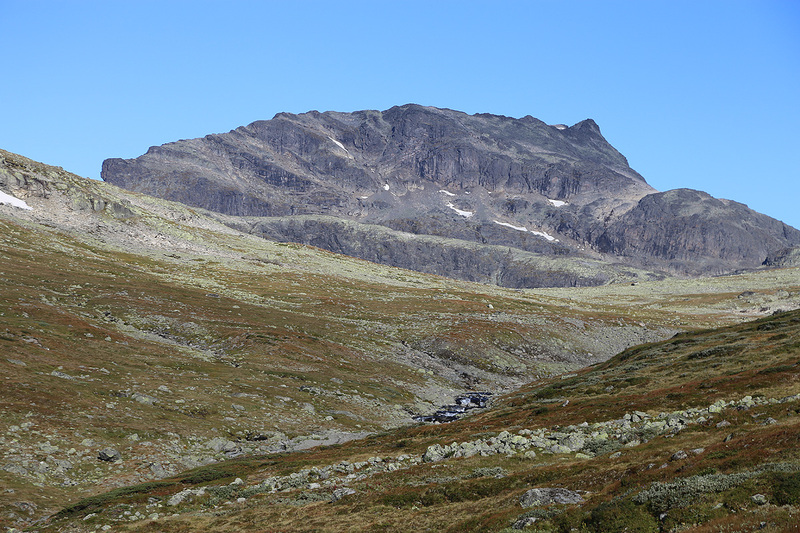 Descending slightly, then passing Midtre Svartdalspiggen at 1615, time was certainly moving. From here, Store Svartdalspiggen looks impossible steep. I knew that I needed to do a bypass out on the west slope before climbing back onto the ridge a bit north of the summit. Here, I likely did some navigational mistakes. I kept running into small scrambling problems, the a long, loose traverse. I decided not to climb up then risk having to descend again. In summary, this was the most unpleasant part of the entire trip. 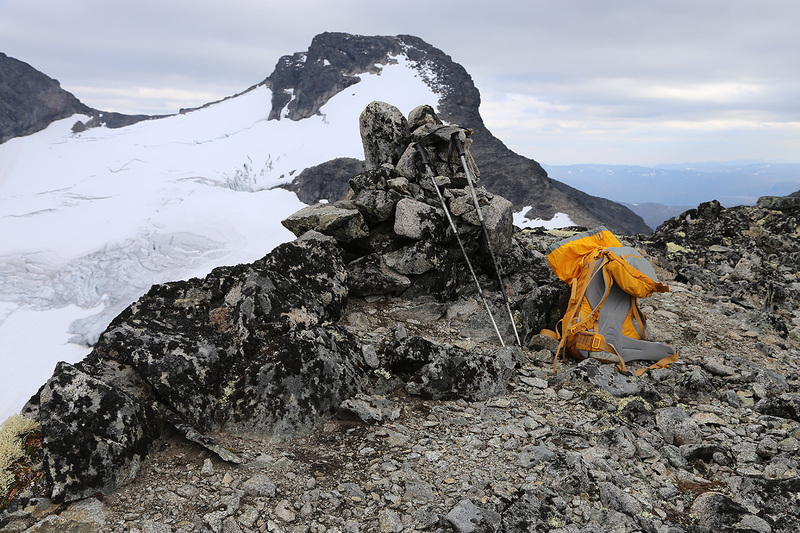 I finally regained the ridge at 1730, left my pack and headed south for the peak. It quite amazing that the same peak can look som differently from two opposite sides. Almost completely flat and quite wide. 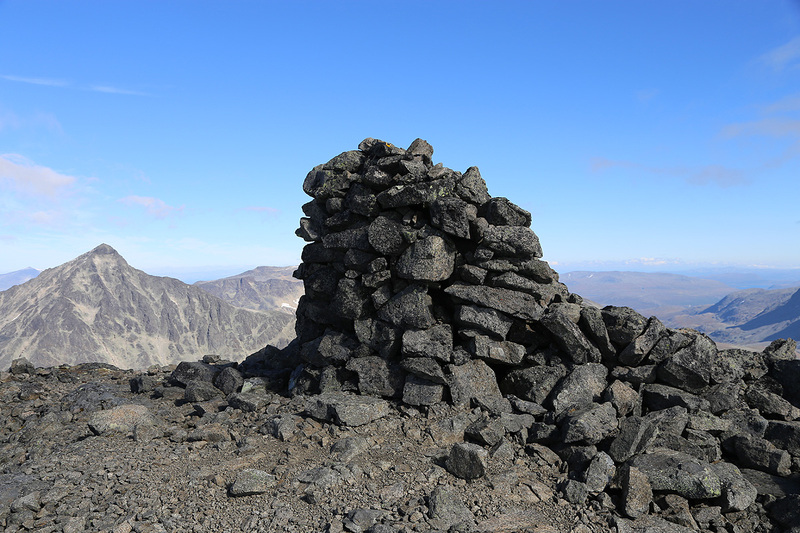 I took a short rest at the summit at 1745. 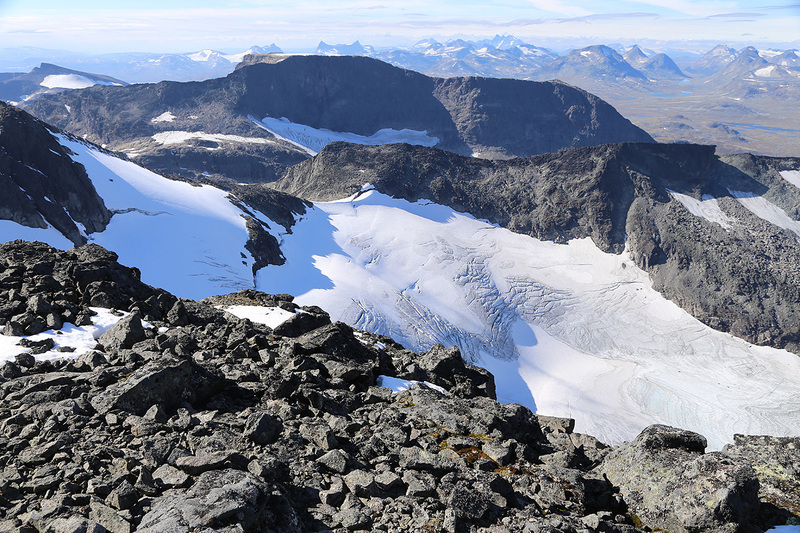 A very impressive view to look back at Mesmogtinden and Langedalstinden from here. 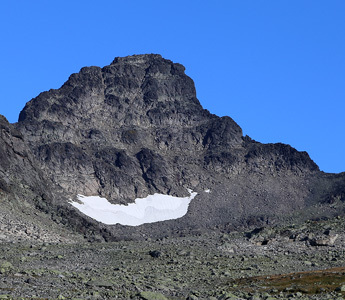 Only one small summit left, how far would it be to descend to Gjendebu? Well, I walked back to my pack, then continued the relatively easy scramble along the ridge towards the final summit point of the day. The best route is likely a bit left (west), I stayed more or less on the top ridge and managed to get into some harder (YDS) class 3 terrain among huge boulders. Finally there, the time was now 1820. A little way downhill on the Gjende side, I suddenly discovered a person! The first one since the boat on Gjende. It turned out to be Maria from Slovakia. She worked at Gjendebu and had the afternoon off today. Then she decided to go hiking. We slowly started going down. It is indeed a long way down and I felt that the day had taken its toll. I was definitely about to get tired. 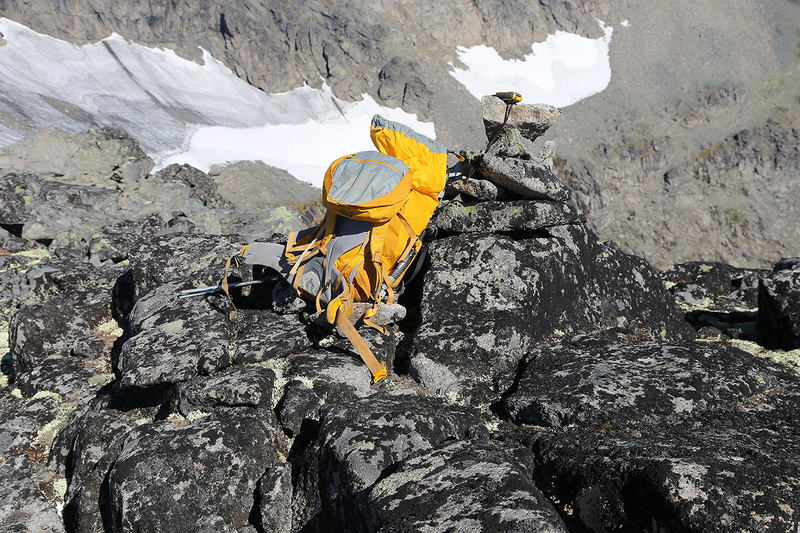 We talked a bit as we followed the cairns downslope. Maria told me she wanted to pick some blueberries further down, I totally forgot about this and stopped to wait for her before walking the last, flat section across to Gjendebu. After 10 minutes, I remembered the blueberries and continued to Gjendebu, arriving there at 2100, just as the day was about to end. Maria showed up a bit later. 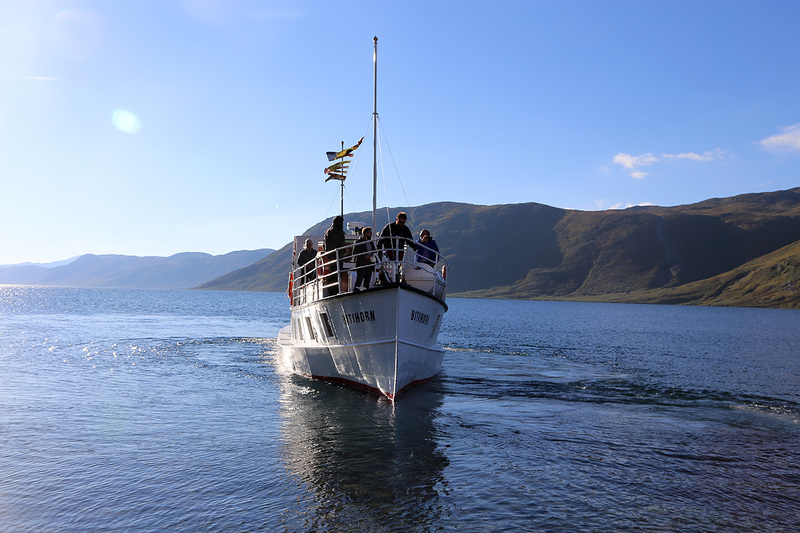 Gjendebu was crowded of guests, many had arrived by the boat from Gjendesheim. A second serving of dinner was just about to begin. I got myself a big glass of water, a coke and a large beer. A very long, but also very nice day had come to an end. Tomorrow, I would continue north and attempt Store Rauddalseggje.